Teriyaki marinated wild salmon with mango, onion, tomato and avocado. Served with asparagus, rice and salad. OK, salmon isn't all that Island-specific, but it paired nicely with the Dharma Initiative branded Merlot. Watching the clip show, it's pretty clear that Lost is particularly unique in television history. Since having the most expensive pilot in broadcast television history, Lost is one of the last shows to film on 35mm film, rather than HD digital video, and may be the end of an era in large scale production for network television. Aside from The Simpsons, does any other show use a full orchestra score as much? Is anything else on broadcast as ambitious as Lost? On HBO and AMC, Breaking Bad, mad Men, Treme, as well as the forthcoming Boardwalk Empire and Game of Thrones may have comparable levels of ambition. But will any of these ever be as widely watched as Lost? 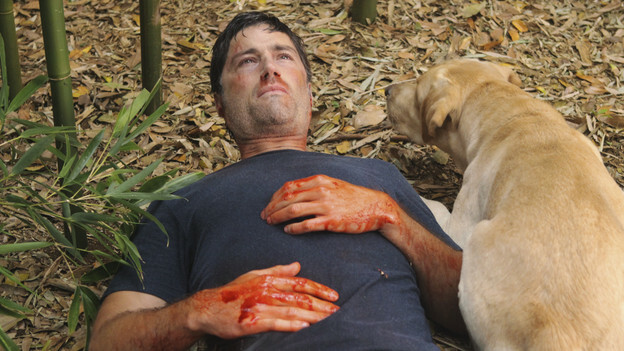 But what makes Lost so special is the breadth of the depth of the fandom. While it may not be the most watched show on television, it must be the most popular show that has such a high percentage of devoted fans. After the jump, 10 Favorite Lost episodes (inspired by Todd VanDerWerff's ranking of all 110 episodes at the LA Times. This page contains all entries posted to Buzz Rant & Rave in May 2010. They are listed from oldest to newest.